Mr. Savvy and I are pretty lucky in that we share a lot of the same interests so we always have things we like to do together. During the week, though, we’re often both tired after the long day and enjoy settling down on our comfy sectional with the cats, some dinner, and our favorite TV shows to watch. When you love watching TV and movies as much as we do, it’s pretty important to have something awesome to watch them on. 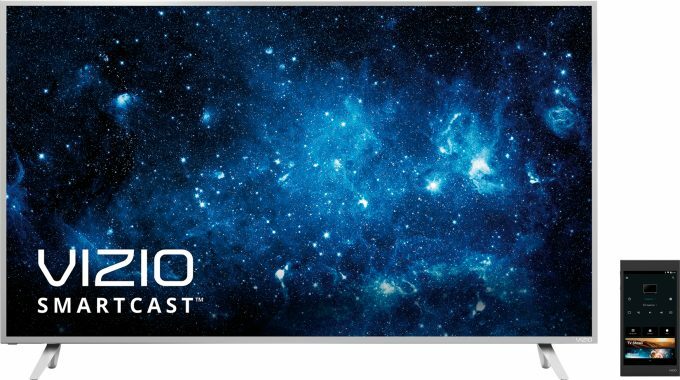 That’s why I’m sharing 5 reasons to love the VIZIO SmartCast P-Series Ultra HD HDR Home Theater Display today. What you love about watching TV won’t change, but how you experience it will never be the same. 1. It’s the first 4K Ultra HD display to have a ton of awesome features. The VIZIO SmartCast P-Series features High Dynamic Range with Dolby Vision, Ultra Color Spectrum, and the features below. 2. It uses a 6″ Android tablet remote. The tablet remote comes preinstalled with the pretty awesome VIZIO SmartCast app which easily lets you interact with the TV. 3. The visual experience is pretty darn awesome. Seeing this TV display in person is truly a treat. It has a gorgeous brightness and radiant contrast with captivating color. It has full-array LED backlighting and up to 128 Active LED Zones™ that deliver exceptional light uniformity and deeper, richer black levels. 4. Google Cast is built in. Google Cast is pretty cool as you easily cast from your computer, phone, or a variety of apps, but you usually need extra equipment to do so. However, this TV has it built right in so there’s no extra expense or hassle. 5. You can easily browse movies, TV, and even music. Using a traditional remote these days is kind of like trying to text on the old cell phones where you had to press the same button multiple times to select another letter. So many interfaces let you search, but it’s time-consuming to search by using the remote. By having the tablet as a remote, you can easily swipe and type to browse what’s on or find your favorite movie to stream. You can even use voice-based commands! If you’re interested in this VIZIO TV, check out the deals you can find at Best Buy. There’s also a video you can see for more information about the TV here. « Does Life Coaching Really Work?